What was the first class offered at Digital Scrapper (a.k.a. Scrapper’s Guide)? I’ll be honest, I had to phone a friend for this answer. Linda Sattgast started working on “Learn Digital Scrapbooking” in 2001. It was first released to the public in 2003. How much time does it take an instructor to create a class? I’m guessing this question is going to stump you. So, I’ll give you a little bit to think on it. When you’re ready, scroll down to the bottom of this email for the answer. How many classes are currently available in the QwikLearn classroom? There are 20 classes currently available for purchase. How many of the classes are for Photoshop Elements? All of them. They are all geared toward Adobe Photoshop, as well. Who is currently creating new classes? Jen White, Jenifer Juris, and Syndee Rogers (shh, it’s a secret!). We’re always on the lookout for great instructors. How many new classes are planned for in a calendar year? The goal is to offer you 4-6 classes per year. How often do you have BIG sales? Our big sales event happens once in the spring and once in the fall. Speaking of that . . .
That “once in the spring” mentioned above is happening right now! Check out the details below. 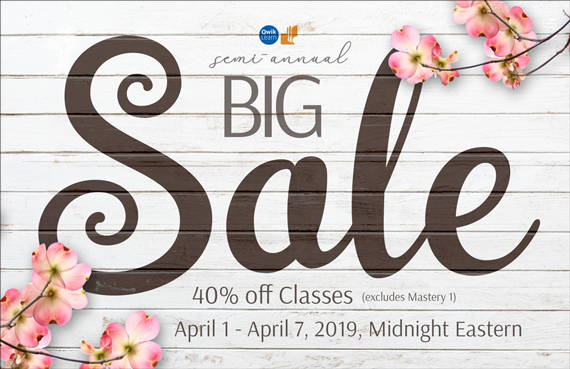 From now through April 7, 2019, save 40% on classes in our QwikLearn classroom. Sale excludes Mastery 1. Browse our wide selection of classes now. NOTE: The Lifetime Premier Coupon Code is applicable at checkout for extra savings. If you are logged in while browsing, classes you DO NOT own will show a price, while classes you DO own will show a completion percentage. 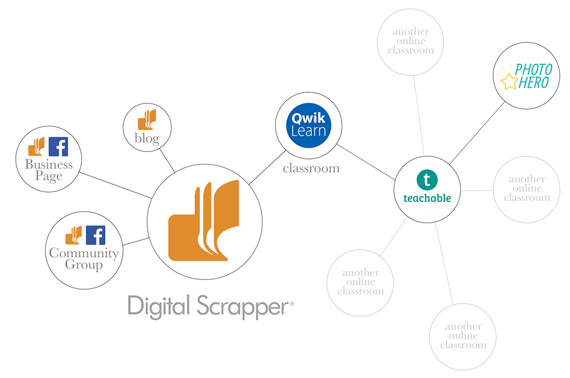 Are you still slightly confused about the whole set up of Digital Scrapper? Do you know what QwikLearn is? Do you understand how Linda Sattgast’s Photo Hero website fits into the whole scheme of things? If so, here’s a graphic that may help. This newsletter is coming to you from the big orange book in the middle of the graphic. I hope this helps! How Much Time Is Involved in Class Creation? I can tell you, from my experience of creating classes and watching others create, that it takes an instructor an average of 4 months to create a class. Some are a wee bit shorter, like two months, and some are a bit longer, like 6 months. It’s a HUGE time commitment. We LOVE to teach. We love seeing you create and learn new things. We LOVE the reward of a job well done. And, most of all, we LOVE our students… YOU. We can’t wait to see you in your next class!